I have this book 5 stars. 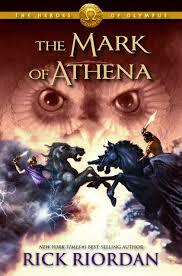 It was fun and exciting, and a tremendous telling of Greek Mythology. I'm getting deeper and deeper into the whole Percabeth ship, and I'm excited to continue on in the series. Sadly, I have had the ending of the book spoiled for me, I was on Instagram and someone made a post about Percy and Annabeth falling into Tartarus, so that kind of ruined the weight of that plot twist. I still loved the book and the fact that that was spoiled didn't ruin the book for me in any way. I love Percy, he is just so funny and sweet. His reunion with Annabeth was my favourite, they ran into each others arms, and then Annabeth judo flipped him over her shoulder and everyone around them was like, "WTF?! Is he okay? Is she going to do that to me next?" and then everyone that knew Percy and Annabeth were just there like, "Nahhh, everything's fine, this is just them being cute together." Tell me that is not the truth. Tell me. I really wish Grover was here. I miss him. I wish the gang would be back together. I really hope in one of the next two books there is a whole Percy Grover reunion scene too because it's been too long. The bromance boiling between Jason and Percy is just so fabulous (I'm running out of adjectives). And the sismance (is that a thing) between Piper and Annabeth were heartwarming. The worst thing that could have happened in this situation would have been that they hated each other a lot and were forced to work together and then everything would fall apart. Thankfully none of the happened and it was a mostly joyful book. What I love about Rick Riordan's writing, is that he never exhausts a certain thing. They don't constantly fight the same god or group. They have a new fresh face in each book, Rick has managed to stretch out all of the Greek (and Roman) mythology into 3 different book series'. I think he has done a wonderful job and I will continue to read his books until the time when he stops writing them, probably a lot of rereads after that too. I feel really bad for Leo, he's just so lonely. He is the seventh wheel, everyone else is dating each other, and whenever there is a partner up sort of thing, he's usually just paired with a couple or left to man the Argo. Even from his point of view you can tell that the loneliness weighs on him, especially after everything Nemesis spouted about him being an outsider in the group and everything. Am I the only one who thinks that Nemesis may be up to something? It's just one of my hunches, she probably isn't even up to something, but I just feel like she is a bit too suspicious. She showed up out of nowhere and told Leo that if he used the fortune cookie she would help him with something. She didn't even want anything in exchange for her help. I know that because of this Percy and Annabeth fell into Tartarus, but that isn't really anything for Nemesis to gain from, unless she has that ulterior motive and that's just where she wanted them. I''ve have now officially waited 3 books for Solangelo to become a thing. Seriously, when is it going to happen? I know that this is definitely a thing because Tumblr and Instagram. I feel like they are going to be so cute and I need that in my life, because I love the whole grumpy grump falling in love with someone who's very chipper and sunshiny. Sounds like otp material to me. “Bacchus scratched his stubbly chin. “Ah… yes. John Green.”“Jason Grace.”“Whatever,” the god said. Annabeth wanted to sob. She wanted someone, anyone, to be here for her. She wanted Leo with his fire skills, or Jason with his lightning, or Hazel to collapse tunnels. Most of all she wanted Percy. She always felt braver when Percy was with her.